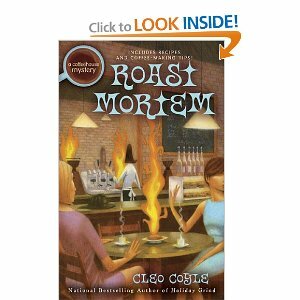 Roast Mortem ~ Book Review. 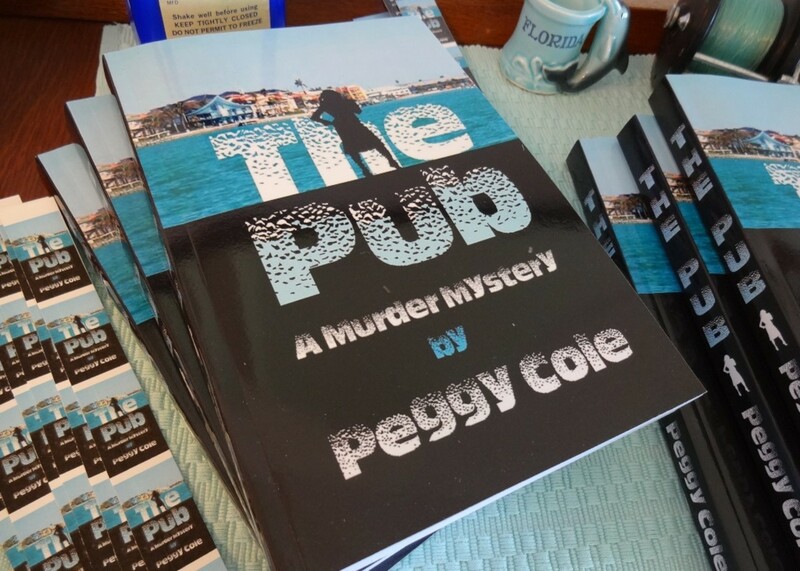 Each Coffee House Mystery starts with a prologue in which the readers get a tantalizing glimpse of the crime and the criminal without knowing the identity of the criminal, or his or her motive for the crime. The Prologue to Roast Mortem shows us a nervous arsonist in an alley, looking for a door with a brass knob. There is a brocade curtain inside, separating the small utility room from the caffé. The arsonist puts a "glossy tangerine sack" on the floor. "Cloying scents of soy and garlic still haunted its boxy interior, ghosts of last night's Korean takeout. The reinforced bottom and laminated sides made it sturdy enough to carry the necessary items." The arsonist hopes the building is empty at the time, so that nobody gets hurt, but realizes that it's too late to do anything about it now. Then, the arsonist thinks, "The schedule was set for me, and I held up my end. Tonight Caffè Lucia will burn. If people get in the way, it's their own stupid fault." The Day The Fires Began. It seemed to Clare just like any other day. Clare drives Madame to Queens to collect an old Blend roaster that Enzo had bought used from the Village Blend Coffeehouse back in the '60's --- as well as a photo album with pictures of Madame and her late first husband, Antonio Allegro. Esther tells Clare that she hates to leave with so many customers waiting for their "java hit before heading home." Tucker Burton, the assistant manager of the Village Blend, had arrived on time for his shift, "and was just tying on his Village Blend apron," but his shift partner was not yet there. Clare tells Tucker that Gardner is stuck in traffic on the New Jersey side of the Holland Tunnel. Not only that, but fellow barista Esther Best is finished with her shift, and she has to be at Columbia to assist with the the "Semiotics of Urban Expression," class. So, she cannot stay to help Tucker with the customers lined up all the way out the door. Clare tells Esther to call Vicki Glockner, "a young woman with fluffy, crumpet-colored curls" and promise to pay Vicki double time until Gardner arrives for his shift. Vicki arrived and waved, "Hey, everyone!" while Clare was on the phone a few minutes later. Alf's daughter had been a barista at the Blend for a little while. Alf used humor as a way to make the world brighter. He spoke with the folks in line at the Blend while he was there, and made them laugh --- even before they'd had their java. At least, Clare had been convinced it was murder, right from the start. But, official law-enforcement believed it was just a robbery gone bad. On the drive to Queens to meet Enzo, Madame explains to Clare that Lorenzo Testa came to work for Madame and her late first husband, Antonio Allegro, in the '50's. At the time he was "fresh off the boat from Italy." His art became very popular in Manhattan. 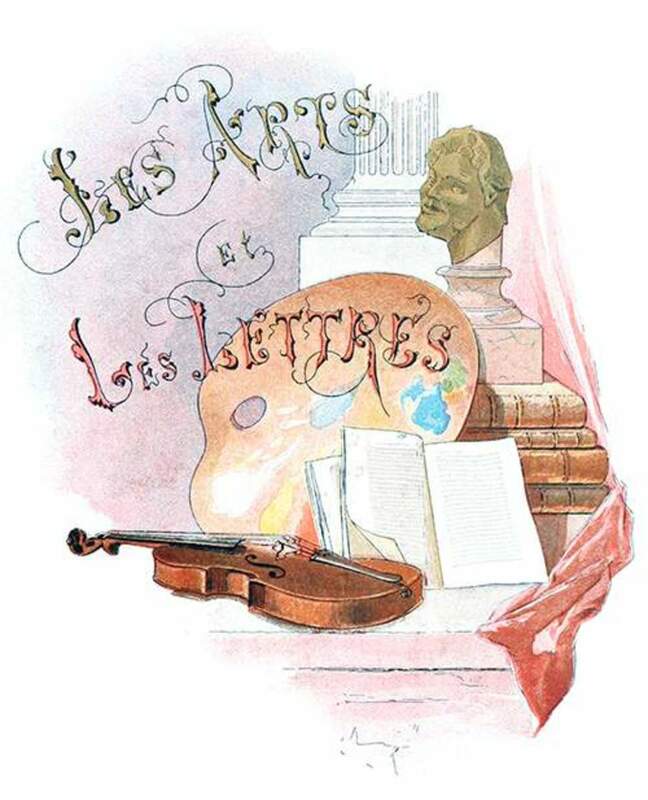 "At one point you could see his trompe l'oeil frescos in dozens of pizzerias around town," Madame tells Clare. But, Lorenzo had to relinquish his art career because he and Angela were going to be parents, the same year Angela's father died. Angela needed Enzo's help managing her family's caffé in Queens. "And sadly, last year, Angela passed away during their annual visit to Italy . . . "
Caffé Lucia is named for the daughter of Angela and Lorenzo. Lucia is now in her forties. Why Did Clare and Madame Visit Queens That Day? . . .Madame and I made an incongruous pair. At our core, however, we weren't so different, which was why our relationship had survived my late-teen pregnancy and hasty marriage to her wayward son, his drug addiction and recovery, our rocky divorce, and my decade spent in New Jersey exile before returning to Manhattan to run her beloved coffeehouse again. The latter development was the reason I'd agreed to drive Madame to Queens today. A valuable piece of Village Blend history was waiting for us at Astoria's Caffé Lucia, and we were both determined to reclaim it. 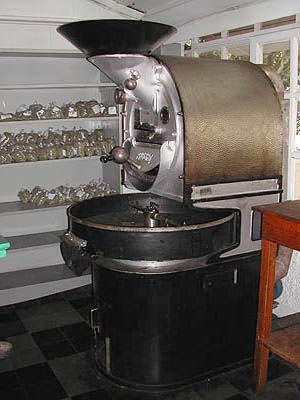 While Madame was thrilled about the photos, I was itching to get my paws on the old Probat, a small-batch German coffee roaster, circa 1921. Enzo had bought it used from the Blend in the sixties. After Enzo's (very unpleasant) daughter left, Madame, Clare and Enzo retired to the basement to look over old photo albums, drink grappa and fox-trot to Tony Bennett. Clare received a call from Dante Silva, a barista from the Blend, who was standing outside Caffe Lucia on the sidewalk at the time. 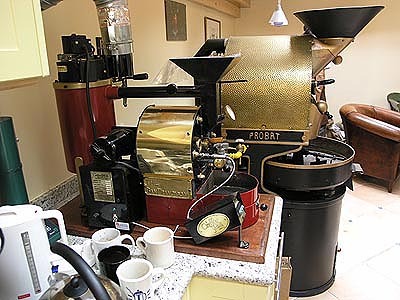 He'd heard about the Probat from the other baristas, and wanted to take a picture. Dante is an artist. Clare is a little surprised to smell knockwurst on Dante's breath. Then she finds out he had also been drinking beer at the Bohemian Hall Beer Garden. "I almost laughed. Not so long ago someone as terminally hip as Dante Silva wouldn't have been caught dead at an outer-borough beer hall. But that was before the Great Recession completely flipped New York's social scene." He took photos of the magnificent mural that Enzo had composed on the wall of Caffè Lucia. Clare tried to secure the front door. "That's when the bomb went off." First came the sound, a monumental whoosh followed by a hissing roar. Then the white-hot concussion rippled through the air, the caffe's front window exploded outward and the blast washed over me. Smoke rolled out of the caffé, the noxious fog billowing upward. . .
Flames were repainting the caffé's walls, spilling their colors onto its tables. The searing light in the urban night would have been beautiful if it weren't so deadly. Not such a great visit to Queens this time. In the Intensive Care Unit, after the fire. Clare remembers a time during their marriage when Matt almost died from a drug overdose. That --- along with his womanizing --- is one of the reasons Matt and Claire were no longer together. Matt dropped his suitcase (loudly) . . . while simultaneously sliding a heavy backpack off his . . . shoulders. It hit the ground with an equally subtle thud. After asking Esther and Tucker to make two doppios, Clare leads Matt to a corner table of the Blend, in order to explain more fully. We came to our usual little corner table, which stood next to the line of tall French doors. On days like this I expected a drafty chill, but our old hearth was close by; and even though the fire wasn't what it used to be, the heat was still there for Matt and I, providing just enough warmth to keep us comfortable. I sat with my back to the smoldering embers and pointed to the chair opposite mine . . . "Sit. I'll tell you the whole story . . . "
After Clare finished the story, Matt said, "Sorry I blew up." Clare understood. Tucker brought the double espressos to their little corner table. I really love this touching little passage. It is important to the plot, but it also exemplifies some great writing. Even though there is a lot of movement, the reader is never "lost." Matt has been far away. He enters with his travel gear, which he tosses down with a thud. He had passed a newsstand. He's upset about it. He thinks it's a bum deal that he had to find out about his own family from a newspaper shortly after arriving at JFK. He's still inside the door --- or close to it. Clare goes to the counter to speak with Esther and Tucker, whose usual banter she'd had to interrupt. Then, she returns to Matt (still by the door) "stiffer than Oz's Tin Man." She signaled for Matt to follow her to a corner table, answering his agitated questions while keeping her voice low, hoping he would do the same. The fire and the burning ember imply that perhaps all is not over between Clare and Matt. --people who likewise love and care about them. PS: Lots of typos here, even in the passages I love the most.
" . . . and even though the fire wasn't what it used to be, the heat was still there for Matt and I . . . "
I think that should have been, " . . . the heat was still there for Matt and ME . . ." ??? Or, " . . . for US. . . "? In any event, something in the objective case?? Since Matt and Clare are the objects for whom the heat was still there. There actually many typos in this book, as in most books nowadays, wherein human editors are being replaced by spell-check programs, which only distinguish between word and non-word. Nothing else. Nevertheless, it's kind of sad. I don't usually bring it up in reviews, because it's so prevalent these days. One criminal doesn't know the other two, or even that they exist at all. Yet, two brave, kind firefighters end up dead due to that third criminal. Or, perhaps, that third criminal combined with the work of the other two. 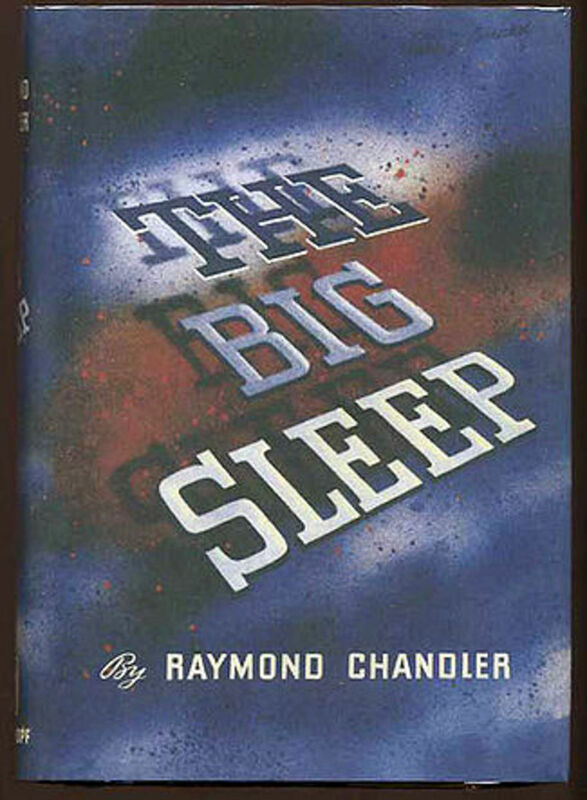 Part of the plot is based on Alfred Hitchcock's Strangers on a Train, perhaps with a little Double Indemnity thrown in. I found the solution extremely difficult to figure out, even following all the clues, which I'm not very good at anyway. There are lots of red herrings, which is exactly what a good mystery, cozy or other, should have. In Holiday Grind (see above), official law enforcement takes the easy way out of Alf's murder, and dismisses it as a robbery gone bad. After all, he WAS carrying all those cash donations. In Roast Mortem, the death of one of the firefighters would have been listed as suicide, had it not been for Clare's sleuthing. The death of the other would have just looked like an unfortunate accident. That third criminal would not have been caught at all but for the quick thinking and fast action of Clare and Matteo. We met Michael Quinn before, in Holiday Grind. Michael Quinn, the firefighter, is the first cousin of Mike Quinn, the cop, who is also Claire's boyfriend. Michael Quinn's firehouse plays a major role in Roast Mortem because the criminals are arsonists. There is a subplot involving the two Quinn cousins, as well as love triangles, one real and one mostly imagined. The subplot is contrived, forced and violent. It doesn't add much to the story, in my opinion. "The arsonist puts a 'glossy tangerine sack' on the floor. "Cloying scents of soy and garlic still haunted its boxy interior, ghosts of last night's Korean takeout. The reinforced bottom and laminated sides . . . "
The arsonist used the Korean takeout bag to carry the necessary items for a bomb, but Mike Quinn tells Clare that Detective Finbar Sullivan ("Sully") is addicted to Unidentified Flying Chicken, even though there are only three stores in the metropolitan area. The Korean takeout in the glossy tangerine sack with nylon rope handles was Mike's way of taking care of dinner after Clare's terrifying ordeal at Caffè Lucia was over. Clare Cosi's Korean-Style Sweet and Sticky Soy-Garlic Chicken Wings. It looks simple, inexpensive, easy and delicious. My kind of recipe!! She has also created a recipe for Sweet and Tangy Thai-Style Coleslaw, to go with the wings. There are many other recipes in this book, as well. And, they all look extremely good --- especially James Noonan's Triple-Threat Firehouse Penne Mac 'n' Cheese, with Carmelized Bacon Bits on top. I don't know if I can wait much longer to try that one! Ooh-la-la! Too bad about poor James, though. Rest in peace, dear brave friend. Your recipes will love on, though. Gimme! Coffee is New York's ultimate no-nonsense espresso bar and artisanal coffee roaster. Order beans online or become a wholesale client. ~Cleo Coyle says they handle an exotic coffee sold by the only female coffee miller and exporter in Ethiopia. The authors thank the manager and owners of this place. It's a very good book, and those recipes are awesome. Thanks so much for stopping by, dear. Yes, thanks, Au fait. I hope that you and yours are also doing well. I'm really glad you commented here because it made me notice a couple of things that needed correction. Another great review and it's sounds like a pretty good book too. Hope all's well with you . . . Thanks so much for the nice comment, sgbrown. "Guessing" is right. It was quite a puzzle. And thanks for stopping by to read my Hub. Nice to have you visit. I'm afraid I don't get to do much reading anymore, but this sounds like a book that would keep me guessing right up to the end. Thank you for the review! Thanks so much, Au fait, for the nice compliment. And, thanks for reading my Hub. Yes, it definitely is another way to cause trouble. It does sound as if there's a lot going on all at the same time and a lot of different characters. Hadn't thought about arsonists in years, but I guess that's one more way of causing trouble. Well done. Thanks so much, Monis Mas. I do definitely recommend this book, and several others in the series. I have not yet read them all, though. I'm really looking forward to that! The recipes are actually quite awesome, also. The author is very thorough and friendly --- and obviously loves good, homemade comfort food!! Thanks for commenting and thanks for stopping by to read my Hub. It sounds very interested! I may have to look for it. Thanks so much, Suzette. That is very kind of your. It is a very good series. I don't know if I do it the justice it deserves. I love how you wrote your review of this book! It sounds so interesting and I will have to check out this series. I never heard of it before reading your hub. I love the images you included with this review. Thanks for an interesting and informative review. Thanks so much, Nell, dear. Yes, I really need to dedicate some time to writing more Hubs. I'd like to get a little more dynamism into my "Hubbism". You are one of my role models, by the way. Take care, and I hope to see lots more of your great reviews, welcome back! Thanks so much for reading my Hub, Nell. Yes, it is very confusing. So glad you like my review. I feel that it needs a little work still -- but, at least it's up there. I'll try to improve it later. The book is a very good read, and lots of great false clues, etc. As always, it's an honor when you stop by, dear. God bless. PS: I forgot to mention there are a jillion typos in this book. They kind of annoyed the life out of me. I just wanted to mention that, since I forgot to put it in the review. I know that's how they do things nowadays, though. Nobody can afford an actual editor or proofreaders, I guess? Hi, it does sound like a very confusing story, but these are the type that I like to get my teeth into so to speak! lol! great review as always, and nice to see you!